We always remember the happiness happened during daytime and cherish the memories. Christmas is the time we recollect the joyfulness of a gift, presented over a beautiful night. Celebrations will start over a month before and continue its charm to welcome a new year ahead. It’s a festival that passes the message of hope blended with love and happiness. Christmas is observed worldwide irrespective of religion, race and area. Its secular approach is appreciable and welcoming for all self-centered persons who see themselves as the last option in all aspects. Bhasuri Inn, one of the best hotels in Guruvayoor, offers most luxury rooms in Guruvayoor, where we can find dignified experience in each and every corner of the hotel. Rooms are of international quality and services rendered there are outstanding. Good spaces along with nice assistance are the code for a successful commencement. They furnish the rooms for all folks of people, where we can see such a wide range of budget very rarely. Those who are looking for a stay are assuredly searching for clean rooms and friendly services at an affordable rate. All these details can be found clearly at Bhasuri Inn, the best wedding halls in Guruvayoor. As technology grows people search for easier methods for getting details about a place, here Bhasuri Inn is presenting an application for updated information. The ultimate search for a good stay always ends in an excellent food offered there. Bhasuri Inn, one of the best hotels in Guruvayoor, supports a multi cuisine restaurant which is treating all in a same manner without any difference. Coffee shop is always a place where good relations are nourishing. Christmas season is gifting the aroma of cakes and pastries everywhere. Here we can find this aroma in this coffee shop where delicious Christmas cakes are welcoming everyone. Christmas bells’ ringing in this festive season is a feel of happiness and love. Bhasuri Inn, luxury wedding halls in Guruvayoor is witnessing the joining of two hearts and families in the background of ringing bells. Wedding is a point where we change the direction of our life to another route where we get a co-traveler to accompany in our journey. The place which watching the holy ceremony should be of heavenly feel, then only we can experience the real grace of the ritual in its completeness. Christmas season is always a time when exuberance is followed by pleasure and aspiration. We are expecting a prosperous year ahead after these enjoyments. Celebrations are regularly a moment of great get-together and sharing the joy. Bhasuri Inn is ready to welcome this occasion and waiting for a cheerful gathering that serves their love, carefulness and pleasure. Cakes and pastries are the symbol of love that shares not only sweetness but also joy from the depth of one’s heart. 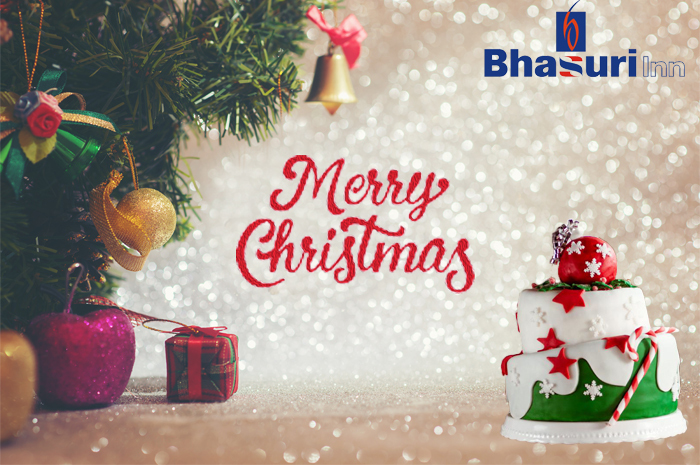 Bhasuri Inn is celebrating this Christmas with yummy cakes and pastries along with ribbons and stars. Let the stars switch their seats from sky to Bhasuri Inn. They are offering a possibility to enjoy this Christmas, a festival which replaces all differences and conditions with love, with the brilliance of stars that embellishes the best hotels in Guruvayoor- Bhasuri Inn.